One of the most prolific singer/songwriters in rock history whose career as a musician lasted four decades (1933-1974), the bulk of which found him as a key figure in the birth and subsequent evolution of rock during its first fifteen years. One of fourteen children, he was christened Ivory Joe at birth giving him a natural affinity for the piano which he learned as a child. His musical family included his preacher father who played guitar, his mother and sisters who sang gospel while his nine brothers included other pianists and drummers. 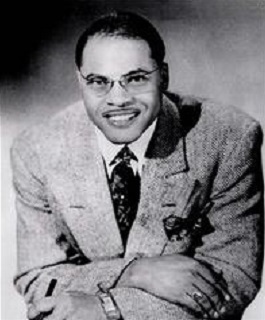 In 1933 Hunter was first recorded singing “Stagolee” for folklorist John Lomax on one of his national tours collecting material for The Library Of Congress, describing Hunter as an outstanding barrelhouse pianist. After years singing and playing clubs in Texas Hunter moved to the West Coast where he started his own record label, Ivory, then later another called Pacific, making him among the few artists, and fewer still who were black, that oversaw their own company at the time. He scored his first hit however in 1945 on Exclusive with “Blues At Sunrise”, a song which B.B. King later sang in an audition to secure his first job on radio. Hunter gave up his labels (though got his first chart topper with one release on Pacific) and signed with growing independent powerhouse King Records out of Cincinnati and recorded in a variety of styles from jazz to cocktail blues before he began hitting the charts regularly with a mix of pop fare and lighter rock ‘n’ roll. His musical versatility meant he was adaptable to whatever trends were hot at the time and as rock became more popular he concentrated largely on that, though he also dabbled in combining country with rock long before anyone else. Following eight Top Ten hits in two years Hunter left King for MGM Records where he became an even bigger star, scoring two #1 hits in his first six months on the label, one of which, “I Almost Lost My Mind”, became one of the most covered (directly and indirectly, with the melody ripped off by dozens of other songs) in rock history. Two other Top Ten hits that same year were all he could manage in his five years there and by 1954, despite cutting some of his most scorching rock sides to go along with his more typical rock ballads, he was in a prolonged commercial draught and sought a change in scenery. Atlantic Records had become over the previous half decade the hottest and most forward-looking rock label in the business and had a reputation for steering their artists into commercial sounds while simultaneously reconnecting them with their roots. Hunter’s arrival came at a time when rock ‘n’ roll was crossing over to younger white audiences which made his re-emergence as a vital force all the more unlikely. He was now past forty years old, balding and though more than capable of delivering the beat-heavy sound that was connecting with the rapidly expanding audience, his preference was always for more mellow introspective sides. Yet as soon as he landed with Atlantic he regained his golden touch scoring a half dozen hits over the next three years including one of the most immortal slow-dance favorites in rock history with “Since I Met You Baby”. His catalog, both past and present, was now regularly mined by other artists (often pop acts) for hits and during this time he befriended Elvis Presley, giving him two songs he’d written (“My Wish Came True” and the storming “Ain’t That Loving You, Baby”) both of which Elvis turned into Gold records. By the early 1960’s Hunter’s time in the spotlight was largely over though he recorded sides for a handful of big labels, including Capitol, Vee-Jay, Stax and Goldwax, before resuming his explorations into country music as other black rock artists such as Ray Charles and Solomon Burke, both of whom were inspired by Hunter, had done to great effect over the previous few years. Though his pure country records resulted in no further hits he was a regular on The Grand Ol’ Opry and when diagnosed with lung cancer a benefit concert for him was held which included numerous country stars along with rock icons like Isaac Hayes. Soon after celebrating his sixtieth birthday in 1974 Ivory Joe Hunter passed away. The writer of thousands of songs, Hunter’s greatest legacy is found in those compositions which touched upon almost every popular style of American music and by a decade of huge hits that helped to define one style in particular, rock ‘n’ roll.